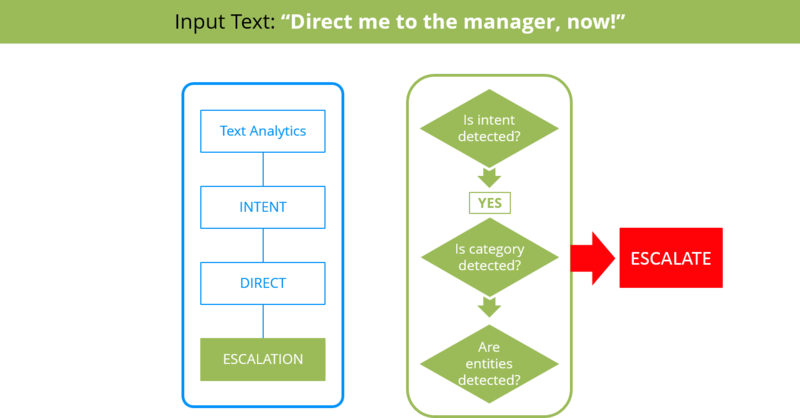 The Pega 7 Platform adds intent analysis to its Text Analytics functionality. Through intent detection, you can determine a writer's intent (in posts, comments, messages, and so on) and determine whether the writer is likely to subscribe to your services or buy your products. The intent analysis can also help you prevent churn by reacting to customers who complain or express dissatisfaction about your offerings. The intent analysis is available only for English language content. I canceled my service in April but continue to get bills. Please cancel the contract as soon as you can. It's been resolved on my end. Thx. I've reordered and have confirmation. No thanks, the deposit & the required payments are done now. I refused because I will be out of town from Thursday till Monday. I told him I wanted to speak to his manager. In uPlusTelco, the staff & the manager are to help with any type of problem. Requested the team to switch back to that plan. I want to switch to another plan which is 1099 rental with 1mbps speed and unlimited download. I am very sorry that the package was not delivered on time. Let me apologize for the inconvenience. Much better and easier communication than with the old provider! uPlusTelco's phones are cheaper and more functional than their competitors'. There's been no response so far! A bank is a place that looks after people's money and keeps it safe. A budget is a plan on how you will spend the money you earn. I'll move over to another provider. We switched back to uPlusTelco yesterday. Why didn't he like the bank? I bought a brand new laptop and it's working great! I can change my plan to online on their website. Besides that they are selling their data packs at such high rates! I hope this happens only occasionally. 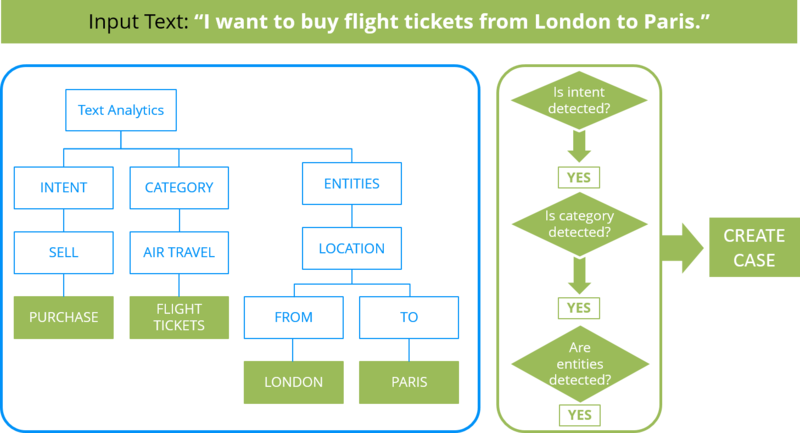 In this scenario, based on the text input, the text analyzer that is used by the chatbot can detect all of the information that is required to create a case for booking a flight. 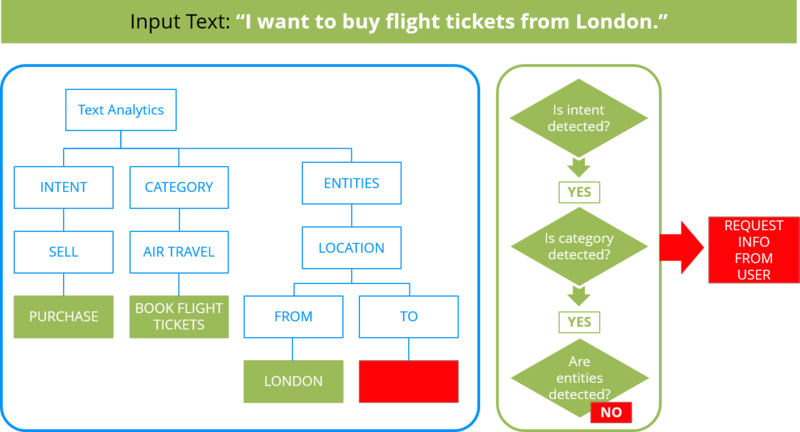 If the information that is provided in the input text is insufficient, for example, if the flight destination is not provided, the chatbot might request that the user provide the missing details for booking a flight. In situations in which the user is unable to get assistance, or is annoyed or irritated, the chatbot can escalate and transfer the conversation to a human operator. For more information, see Intent analysis. .pyOutcome.pyIntents(1).pyName = "outbound > churn"
The text analyzer can detect multiple intent types that characterize the analyzed content. The pyIntents property must be associated with a subscript value (n), where n is the position in the sequence of detected intents. The detected intents are ordered by their confidence score, starting with the highest score.